For those of us that watched Attack on Titan while it was being simulcasted the hype has pretty much gone away. Yeah, the show's English dub is being shown on Toonami and that's awesome, but what we really want is a second season. Most of us probably bought the special edition blu-ray anyway. Unfortunately, the second season is a ways off so all we can do is read the manga. I'm still hesitant to continue down the primary manga route because I really want to wait for the anime, but I need something to read, though. So a couple months ago I ordered Attack on Titan: Junior High. I have been very lazy reading stuff so I've only gotten around to this review. In fact, I'm not technically even finished with the manga yet. I'm close enough, though. Nothing wrong with taking your time, right? For starters, I thought this little spin off series was hilarious. In case you can't guess by the title, this parody series takes place within a school setting. The humans are in one school while the titans are in the other and they rarely interact with each other. Eren Yeager wants to interact with the titans, though. And by "interact with the titans," I mean "kill all of the titans." It all happened one day when the colossal titan stole Eren's lunch (cheese loaf, I believe it was) and ate it in front of him. One thing I loved about this series is its wit. Pop culture references should be nothing strange to anime and manga fans (hell, entire anime and manga can be built from such references), but Junior High really uses it with a razor sharp effectiveness. I don't know just how much was changed during the translation, but the translation as it is is funny. One of my favorite quotes is, "You can insult me all you want, but when I'm done with you, you'll long for death! It'll be torture! Worse than a Cameron Diaz movie marathon!" Another is, "Stop whining, you little pansies. If all you want is more for your money, then go to WalMart, not Wall Rose!" Genius. Again, I don't know if those are the closest to the original translations, but as they are they are pretty funny within the context of the series. 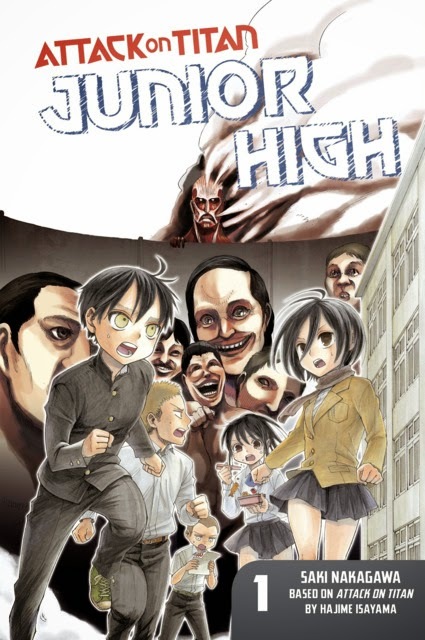 Purists might not like this series because it isn't suspenseful at all and it does spend most of its time poking fun at Attack on Titan, but if you don't take anything too seriously and fancy a good insult then Junior High is well worth your time. The American version bundled all three volumes together and that's pretty convenient. Or at least the Kindle version is that way. I'm not sure about the paperback. If you like the series then you should enjoy this unless you are just too much of a fanboy. If you don't like the series then you still might like this manga since it does spend plenty of time making fun of the story. And no, you don't have to be too familiar with the original story although being familiar with it will help you get a lot of the jokes. I'm mostly talking from a spoiler point of view. P.S. - You also get to see the titans perform in a rock band. Now that's something I'd love to see animated.